There are many reasons why we monitor Arctic sea ice melt during summer. First, sea ice is a key climate indicator. Second, we are in a period of time where ice-free Arctic conditions are becoming more possible as global temperatures keep rising. And third, falling levels of Arctic sea ice have knock-on effects for a number of climate systems that we all rely on. Last week, we pointed out that GFS models were predicting a very warm spike to around 3.5 C above average temperatures for the Arctic come late May. Thankfully, due to the model running a bit hot, such extreme readings did not emerge. However, temperatures over the Arctic Ocean remained about 0.85 C above average overall for the past 7 day period. Consistent, though somewhat mild, warmer than normal temperatures for this time of year over the Arctic during 2018 are still somewhat worrisome. Recent very warm winter years have experienced ‘saving grace periods’ during May and June in which temperatures near the pole returned to near average or slightly below average. This is not the case for 2018 so far. Temperatures have tended to remain warmer than average for the Arctic Ocean and near the pole throughout May. Moreover, short range forecasts indicate that the critical time period of early June could see continued above average temperatures — providing a potential kick for sea ice losses come late season. Overall, GFS model runs indicate that temperatures will remain in a range between 0.5 and 1.3 degrees Celsius above average for the Arctic over the next five days. These above normal temperatures pose increased risk for sea ice losses during the crucial June window. June weather tends to greatly influence late season sea ice totals. A warmer than normal June will produce higher numbers of melt ponds and greater impetus for melt to continue with force through July, August, and September. Cooler and often cloudier Junes have tended to protect late season sea ice from hitting new all time record lows. 2018, so far, has seen a warmer than normal May for the Arctic Ocean. And so we see ice getting swept back behind traditional lines in the Chukchi Sea, in the Beaufort Sea, and in the region north of Svalbard. Peripheral areas like Baffin Bay, Hudson Bay, and the south Kara Sea have seen slower ice melt due to their co-location with trough zones. But it is Central Arctic melt that we should be more concerned about. So we’ll be closely monitoring this region as May runs into early June. This year, two tropical cyclones have sprung up in the Western Arabian Sea. A region where, according to our understanding of climate, “storms do not form.” Well, the climate has clearly changed. Because a storm is raging there now. And for Oman today, these changes bring with them serious threats to life and property. About five days ago, tropical storm Sagar formed east of Somalia in the Western Arabian Sea near the Gulf of Yemen. The storm was notable due to the fact that it was the furthest west a storm had ever formed in this region, according to records. The storm then dumped copious amounts of rainfall over Somalia — resulting in the loss of 34 lives. Just a few days later, a second storm, Mekunu formed in about the same region. Tracking north, it is now threatening Oman with the potential to hit category 2 intensity. Unlike Sagar, Mekunu poses a triple threat due to expected very heavy rainfall, large waves, and storm surge. The region near Salalah Oman that the storm is barreling toward — typically receives just five inches of rainfall per year. But Mekunu could deliver two to five times that amount (or more) in just a few days. Moreover, the flat coastal plain is backed by mountainous terrain to the north. The higher land produces lift that will intensify expected rainfall. And current models predict that more than two feet of water (24 inches) could fall on up-sloping regions facing Mekunu’s advance. What’s notable is that these totals keep rising and that peak local totals for the storm in the NOAA NCEP model show some ridiculous amounts — up to 74 inches (see below). Why are peaks in this model so high? First, sea surface temperatures are very extreme throughout the region. In the immediate vicinity of Mekunu, ocean surfaces range from 30 to 32 degrees Celsius. The waters are about 1 to 2 C above normal and are thus providing Mekunu with a lot more moisture than is typical. However, the larger environment that Mekunu is feeding off of also has much higher than typical moisture loads. For one, sea surfaces east of Somalia have spiked to as much as 5 C above average recently — pumping out great loads of evaporation. Further, moisture levels over the Arabian Peninsula are high due to moisture streaming in along a rather intense subtropical Jet Stream moving over the also much warmer than normal sea surfaces in the Med. The result is a much higher than normal rainfall potential. The significant wave height leads me to think coastal flood potential is a real threat. At some point the water from waves crashing onshore does not have time to drain before the next wave hits. My gut feeling is that we could see a noticeable storm surge that is quite dynamic, with a lot of wave action and rapidly moving water. Expect wave heights to be tremendous. Mekunu’s intensity is certainly quite high. And it is one of a recent spate of storms to impact the region. With research showing that the intensity of storms in the Arabian Sea has increased during the past 20 year period. However, the far western formation of Mekunu and Sagar add a new twist to the story. For it appears that the zone of storm formation is also shifting westward as sea surface temperatures rise and, apparently, Jet Stream changes have the potential to deliver higher levels of atmospheric moisture to the Arabian Peninsula. All of these factors feed both storm formation and intensity potentials. Human forced climate change through fossil fuel burning now presents a serious threat to the world’s coastal cities and island nations. Diverse regions of the world are now facing increased inundation at times of high tide and during storms. Unfortunately, this trend is only worsening. And depending on how much additional fossil fuel is burned, we could see between 2 to 10 feet or more of sea level rise this Century. As the Earth has steadily warmed to 1.1 C above 1880s averages, the oceans of our world have risen. At first, the rate of rise was very mild — a mere 0.6 mm per year during the early 20th Century. However, as the rate of global warming increased and the oceans took in more heat, the middle 20th Century saw sea level rise increase to 1.4 mm per year. By the end of the 20th Century, the polar glaciers had begun to melt in earnest. And from 1990 to the present day, the rate of sea level rise has accelerated to 3.3 mm per year. Due to more warm water invading the basal regions of glaciers and more ice bergs calving into the world ocean, the annual rate at which ocean levels increase continues to jump higher. And during recent years — from 2010 to 2018 — the world ocean has risen by nearly half a centimeter each year (4.6 mm). Now both island nationals and coastal cities face the increasing danger of rising tides, of inundation, and of loss of lands and infrastructure. A rapid switch to renewable energy and away from fossil fuel burning is needed to save many regions. However, due to presently high greenhouse gas accumulation, it is likely that some zones will be lost over the coming decades. Arctic Ocean Deep in the Grips of May Temperature Spike; Beastly Summer Melt Season on the Way? The Arctic Ocean as it appeared from space on May 6, 2018. Image source: NASA Worldview. The Arctic sea ice is presently at its second lowest extent ever recorded in most of the major monitors. However, May is shaping up to be far, far warmer than normal for the Arctic Ocean region. If such high temperatures over this typically-frozen part of our world continue for much longer than a couple of weeks at this key time of year, precipitous summer melt is sure to follow. During recent years there has been much speculation about when the Arctic Ocean will start to experience ice-free summers as fossil fuel related industries pump higher and higher volumes of greenhouse gasses into the atmosphere. In the early-to-mid 2000s, scientific consensus was that melt would tend to be more gradual and ice-free summers would hold off until the final decades of the 21st Century when the world was around 3-4 C warmer than 19th Century averages. But the Earth System is far more sensitive to temperature increases than the early forecasts expected. Major Arctic sea ice losses surprised the world during September of 2007 and subsequently in the same month of 2012. Now, it is obvious that a pattern of far more rapid sea ice melt has taken hold. And the scientific consensus appears to have settled on a more likely and much nearer date around the early 2030s — when the world will have warmed by about 1.6 degrees Celsius. However, when it comes to sea ice, nothing is certain at this time. Any single Arctic year in which temperatures spike — particularly during normal melt season — could result in the losses that we once expected to occur much later in time. There are many factors that will ultimately determine when a summer ice free state occurs. Warm winters are a major one. 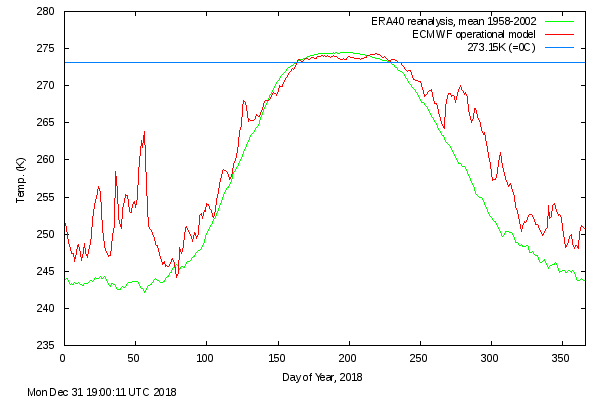 And the past two years (2017 and 2018) have seen Arctic winters in which temperatures hit some ridiculous high extremes. But another major factor is the set-up to Arctic summer that takes place during the window months of May and June. May and June are very important for the rest of the melting season. Not only do we now see these warm air intrusions, but high pressure maintains its presence over parts of the Arctic as well (which means relatively cloudless skies -> insolation -> melt onset and melt pond formation -> preconditioning of the ice pack -> melting momentum that gets expressed during July and August, regardless of the weather)… We have to wait and see what happens, step by step, but this isn’t a good start for the ice. If May and June are unusually warm, particularly over the Arctic Ocean, then the sea ice — which is already greatly weakened — is bound to face an extended period of above-freezing temperatures. If such a period stretches for 5 months from May through September rather than the typical 4 months (June to September), then we are more likely to see the Arctic Ocean briefly flip into an ice-free or near ice-free state for the first time in human history. This year, May is shaping up to be much, much warmer than normal for the High Arctic. Already, a large May temperature spike has occurred (see right image below). A temperature spike which is predicted to continue for at least the next ten days. Not to put too fine a point on it, but this severe warming trend might end up presenting a bit of a problem. The extended period of melt mentioned above may begin in force — setting off a chain of feedbacks that could tip the Arctic Ocean into a far less frozen or even an ice-free state (under absolute worst case scenarios) this year. To be clear, this is not a forecast that such a condition is bound to occur during 2018. It is just an analysis of underlying trends and a statement that risks are higher if such trends as we now observe continue. Late May could flip to a cooler than normal regime. June could be cooler and cloudier than normal (as happened during 2016 and 2017). And if that happens again, we may be spared. 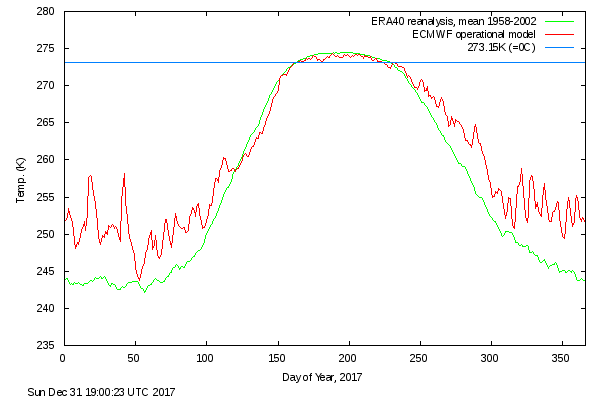 However, we are already on a much higher ramp for spring temperatures in the northern polar region than during 2017. And though 2016 saw a slightly warmer than normal spring near the pole, the May 2018 spike already far exceeds anything we saw at that time. So much, in fact, that present temperatures for May 6 are comparable to those typically seen during early June from the 80 degree N Latitude line to the Pole. This higher ramp and related record warmth is already accelerating melt. Sea ice losses over recent days have greatly picked up and we are getting closer to record low daily ranges. If melt accelerates to a point, the greatly expanded darker ocean surfaces will draw in more heat from the sun’s rays during June — potentially overcoming the impact of the increased early summer cloudiness we have seen during recent years. Such a scenario, if it continues to develop, would be a nightmare from the climate change perspective.